Should London Build a Forest Bridge Across the Thames? 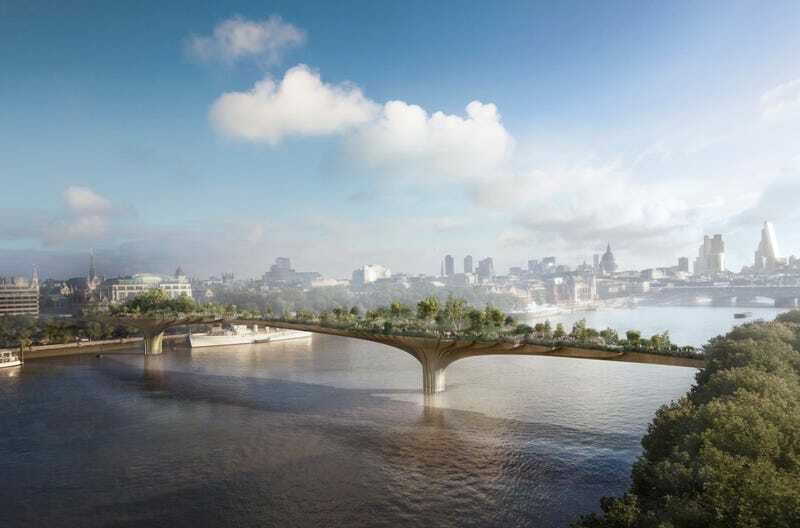 Artist-engineer Thomas Heatherwick's "Garden Bridge" proposal is open for public feedback in the UK. A heavily forested pathway stretching across the Thames, Heatherwick's bridge would be the second pedestrian-only bridge constructed in London in less than two decades, succeeding Norman Foster's initially infamous—but now enormously popular—Millennium Bridge, built back in 2000. The Garden Bridge, a collaborative design by Heatherwick Studio, Dan Pearson Studio, and Arup, "will add to London's rich and diverse horticultural heritage of heathlands, parks, squares, allotments and community gardens and support many indigenous river edge plant species." It's a kind of deliberate crypto-forest—a pop-up landscape in the middle of a river—an artificial woodland that tourists and local bankers alike can get lost within on their lunch break. Say what you want about architects putting trees on everything these days, but it actually looks like an interesting—and much-needed—organic addition to a city rapidly transforming into a maze of reflective steel and glass surfaces. We need some druidry with all that metal! All that concrete needs some jungle!